THEY are the people serving you a coffee in hospital, providing a listening ear to your elderly neighbour, and running an exercise class that helps older people in your community keep fit and stay social. Now, Royal Voluntary Service (RVS) has launched a major new recruitment campaign to attract an army of volunteers from across Leeds to help ease “unprecedented” pressure on public services. There are already around 500 RVS volunteers in Yorkshire, but the charity, which was founded in 1938, wants to boost that number by 10 per cent. It says the challenges facing the UK are “acute” - but that by volunteering, people in Leeds can help to meet that challenge and get huge benefits to their own wellbeing, and even boost their CVs. Commissioned services operations manager for Royal Voluntary Service, Oliver Clarke, who works across West and South Yorkshire and Humberside, told the YEP there is a huge range of volunteering opportunities in the city - from helping run a trolley service delivering healthy snacks to patients on ward in our hospitals, to offering companionship to a lonely older person in their home, to marketing and fundraising roles. Mr Clarke said: “None of our services could operate without volunteers. Royal Voluntary Service has always been there to assist with the needs of the day, within our hospitals and our communities, and now, getting people, particularly older people, out of isolation and into their communities. “We understand the strains and pressures that frontline NHS, for example, are under, and we want to compliment the work they do. There are always gaps that could be filled by voluntary services. 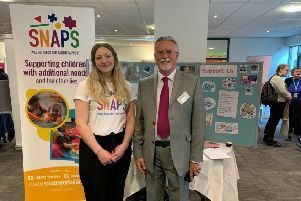 Last year, the charity was re-commissioned by Leeds City Council to run its Healthy Happy Lives projects in Meanwood, Chapel Allerton and Roundhay for the next five years. Part of the project sees exercise classes and social groups operate for older people, and each group is in need of extra help. At Seacroft Hospital, where the charity runs a long-established shop and cafe, it is in need of people to help serve customers and keep shelves stocked. dining clubs with full support and advice from the charity. “We’re keen to hear from anyone who has identified a specific need for a service and is interested in starting their own group,” Mr Clarke said. “We can provide advice, support and role-specific training. The RVS wants to highlight the "pivotal part" volunteering can play in everyone's lives by sharing the boost it can give to those who help others. Its research has shown that volunteering can boost self-confidence, has a positive impact on mental health and teaches new skills . A third of first time volunteers said the experience had made them less stressed, with similar results when looking at positive effect on physical health (42 per cent) and happiness (65 per cent). At the same time, almost four in ten first-timers said their volunteering had made them less lonely. New research shows that volunteering just once a week sparks more joy than any other activity, and matches the feeling of ‘runner’s high’. undertaking but a pivotal part of people’s everyday life.